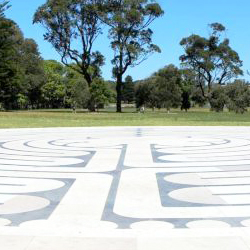 Journey to the Centre – Music for Centennial Park Labyrinth was written in 2014 as a soundtrack for a walking meditation on Sydney’s Centennial Park labyrinth. This 23 minute remix is a longer, lusher version of the original 7minute piece, and was created for group labyrinth walk events where a longer time-scale is needed to complete the walk. The subtitle ‘Palestrina Remix’ pays tribute to the opulent sacred music of 16th Century composer Palestrina who is famed for his rich polyphonic music. In truth, Palestrina can be heard here only as a distant echo filtered through my own compositional voice. Palestrina’s melodies have an ever flowing quality and follow strict rules of counterpoint. My modal harmony and melodic lines dissolve into moments of pure birdsong, and I approach the eternal through the pairing of dynamism & silence, instrumental music & birdsong. Bonus Track – As Small Birds Play. I wrote As Small Birds Play in 2010 when I first moved close by to Centennial Park and loved to sit quietly amongst the Paperbark trees in Lachlan Swamp and listen to the birds and insects there. In the music, bird calls and the rapid, darting, bird movements are suggested through the lively variations of the main melody. This ‘bird’ music is balanced by long high notes and slow, free-flowing phrases that symbolise a kind of deep tranquility or contemplative silence that is so easy to slip into while sitting in nature. My musical expression of that stillness is, in part, influenced by Japanese Gagaku and its free-flowing, breath-length phrasing. As Small Birds Play was used as the anthem for Centennial Park Sydney’s 125th Birthday celebrations in 2013. All music composed by Corrina Bonshek. As Small Birds Play performed by Sue Newsome (lecturer in Clarinet at Sydney Conservatorium of music) with sound recording, mixing and mastering by Benedict Carey.